Using our automated TOGAF® ADM guide-through process, with step-by-step instruction, input references and samples you are ready to kick-start a project of any size. 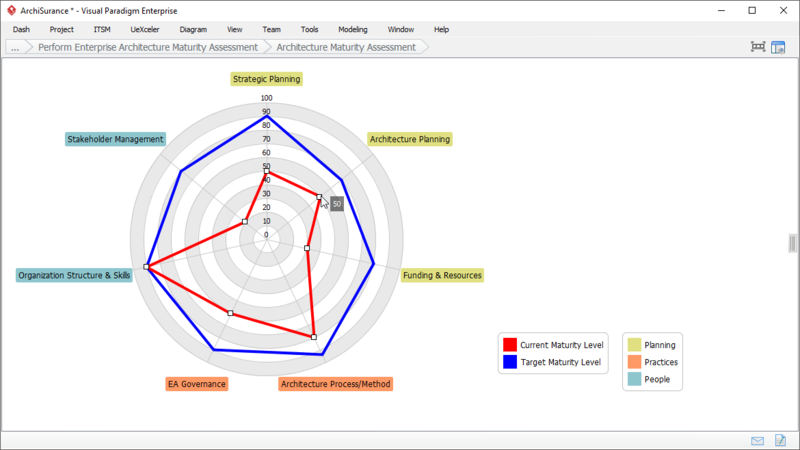 Develop architecture deliverables incrementally and collaboratively with your team members. Enhance and streamline the entire process with automated task management and notifications with task manager in both desktop and/or over the cloud. 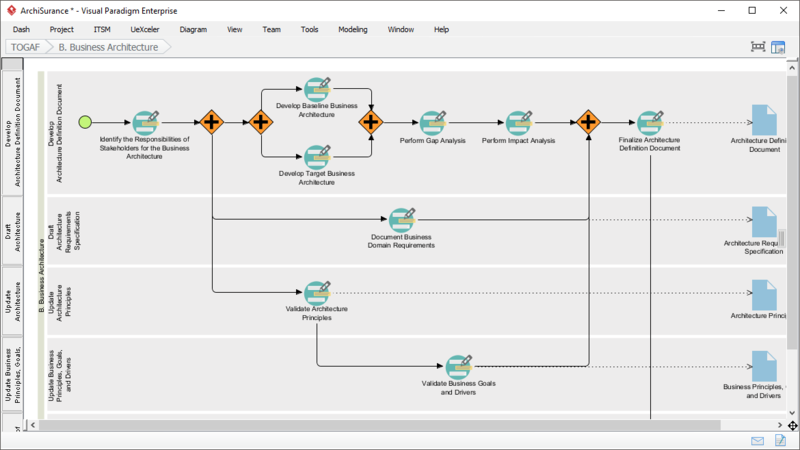 Visual Paradigm is a certified ArchiMate 3 enterprise architecture tool. 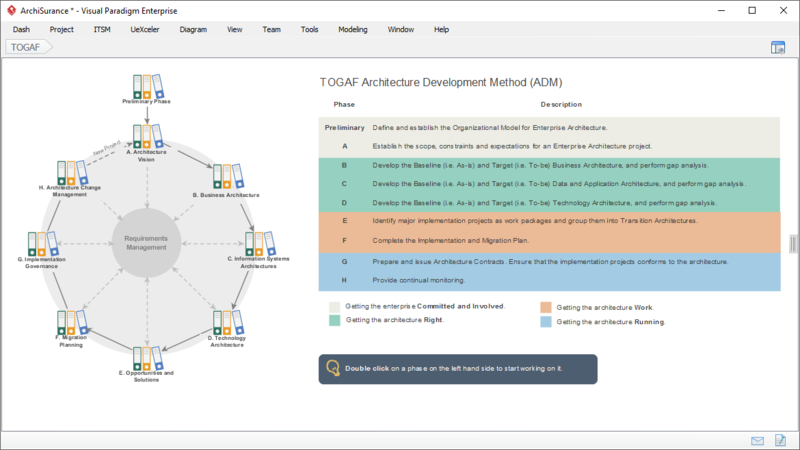 The TOGAF ADM Process Navigator. It covers the nine ADM phases. Double click on a phase to start working on it. Activities of an ADM phase. Each phase contains a set of activities required to perform in order to produce the corresponding deliverables. Performing an activity. 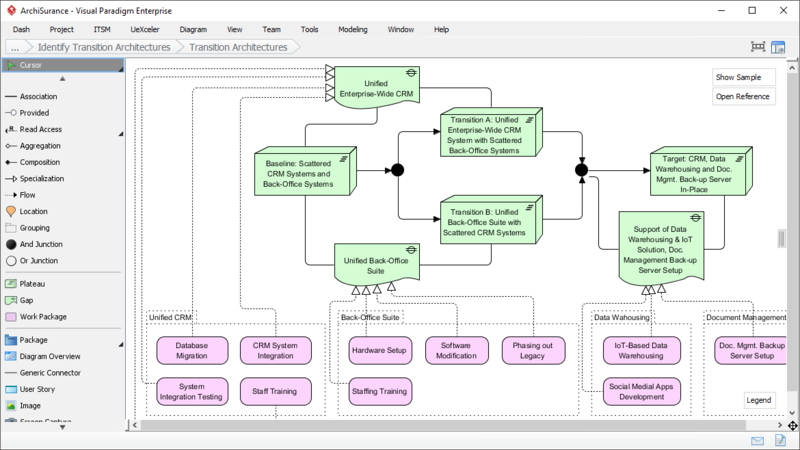 This example shows the use of our certified ArchiMate tool in representing the organization units being impacted by the architecture initiative. Automatic transformation of data. 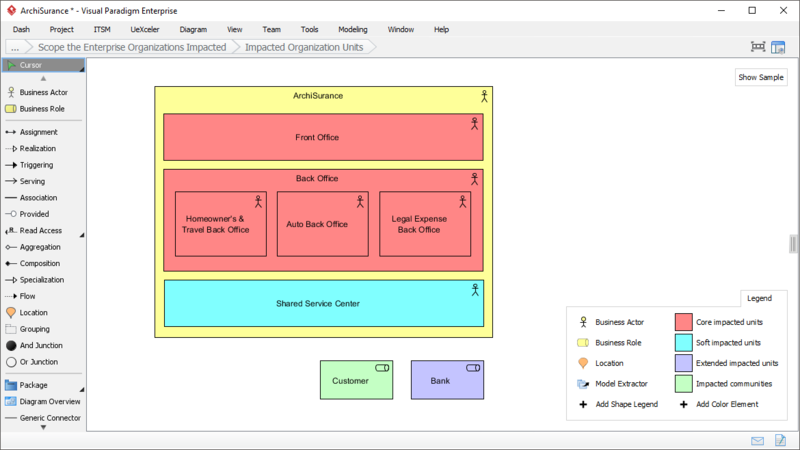 In this example, the impacted units are extracted from the ArchiMate diagram. 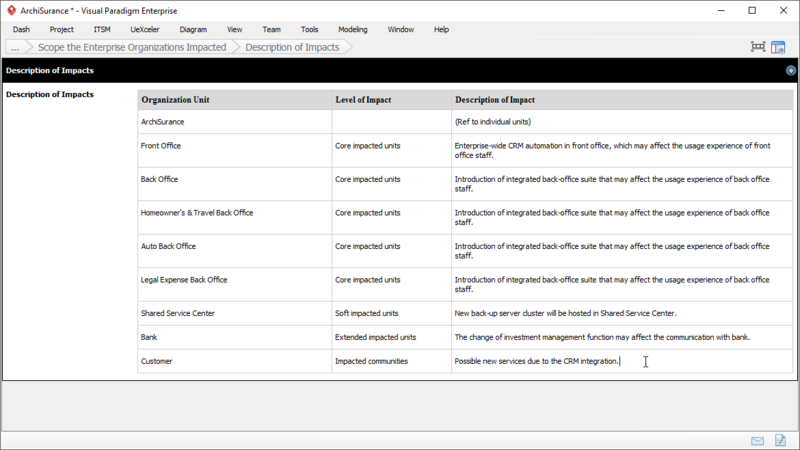 You can then fill-in the description of impact in a table. All activities contains clear instruction. Even with you are not familiar with TOGAF, you can still perform the activities required. Besides instructions, you can also get help by reading the samples we provided. Learning is not needed! 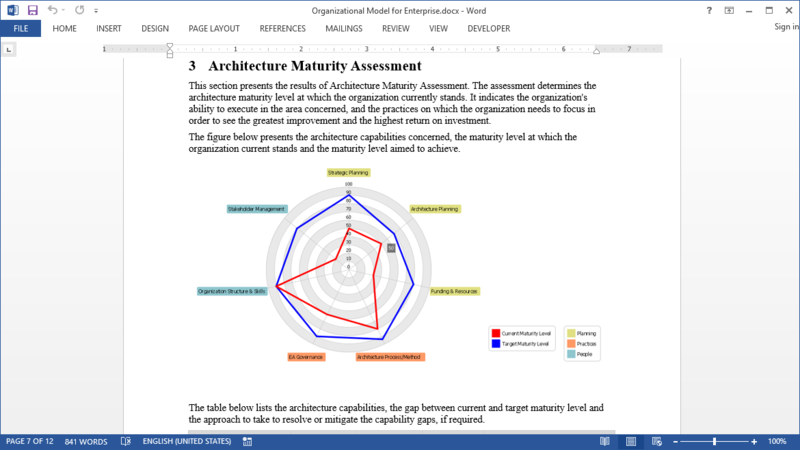 We provide a wide range of Enterprise Architecture tools to support your EA needs. Maturity Analysis is one of them. Generate TOGAF ADM deliverable once your've completed the activities. 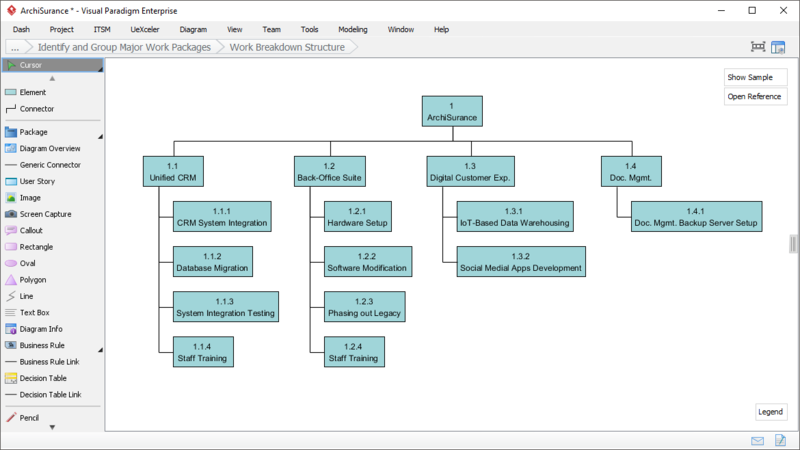 Another sample use of ArchiMate. 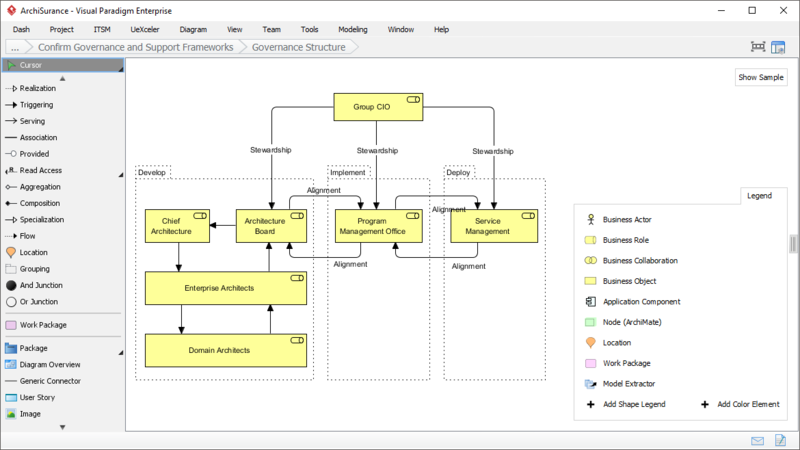 Besides modeling architecture, you can also draw an ArchiMate diagram to represent a governance structure. Besides drawing diagrams, some activities require you to fill-in forms in order to produce deliverable. 'Request for Architecture Work' is one of the examples. 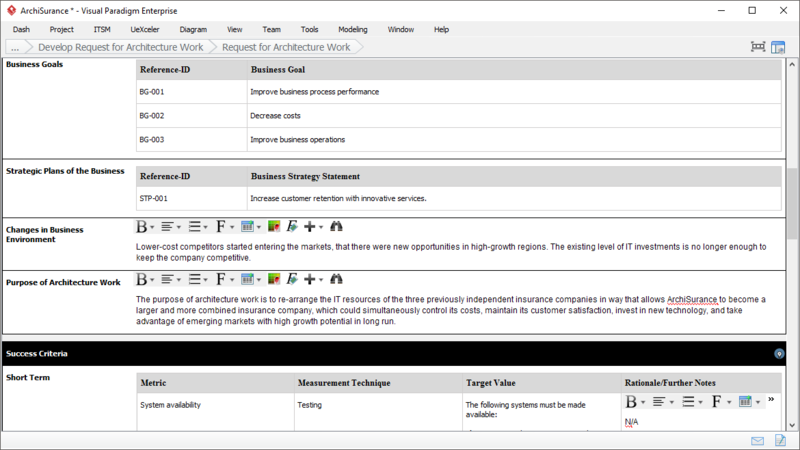 Gap Analysis with ArchiMate 3. Look at the bottom right. It's a color legend that enables you to effective apply color code to elements in diagram. 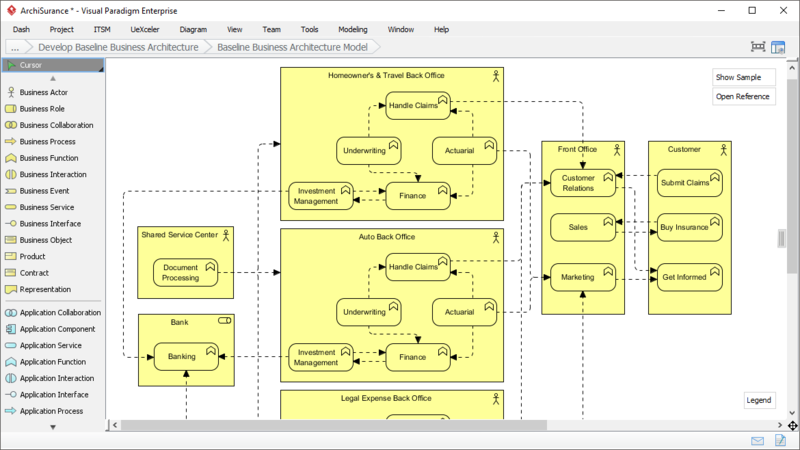 A typical use of ArchiMate 3 Diagram in Enterprise Architecture is for developing the architecture model. 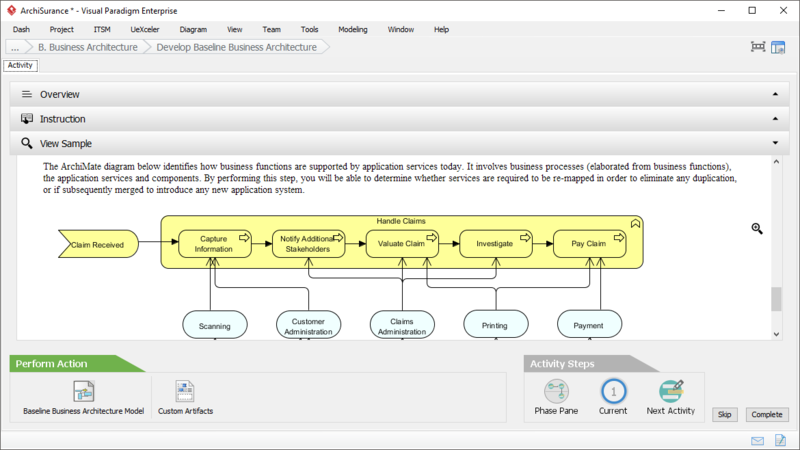 Here is a Baseline Business Architecture Model. 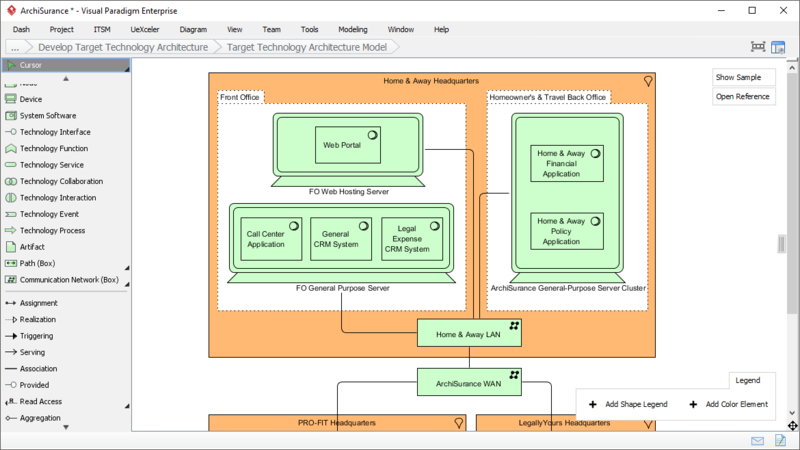 The development of Target Technology Architecture Model is an activity of TOGAF ADM Phase D: Technology Architecture. Draw a Work Breakdown Structure to represent the structuring of work as well as to derive and obtain a list of work packages. The Architecture Roadmap involves visualizing transition architectures as plateau and the association of work packages with gaps. 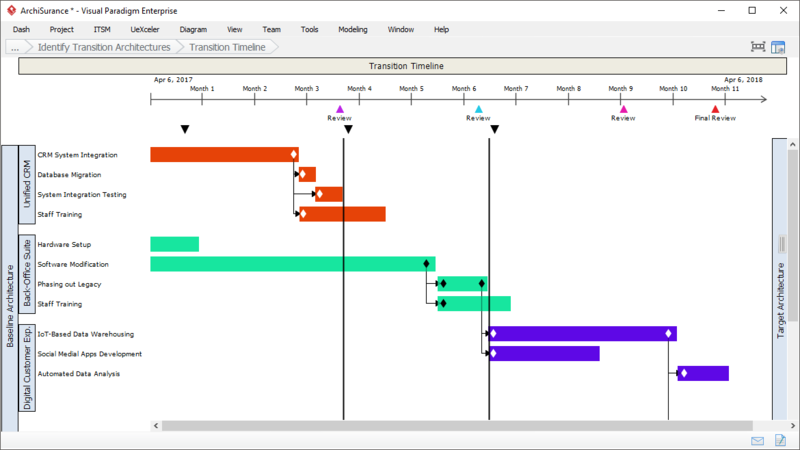 Transition Timeline shows the time frame of architecture activities. It also allows you to indicate the investment points and major milestones. Architecture Repository is where deliverables being archived. While deliverables are automatically archived, you can also put a file into a drawer (in the Architecture Repository) manually. Hard to get Enterprise Architecture development started. It involves a lots of upfront investment, trainings and additional resources. Staffs' skills are no sufficient or not mature enough to properly kick start a EA Project. The deliverables of the IT projects counterdicting with business goal and objectives. As a result, the proliferation of various isolated and ad-hoc initiatives are developed randomly without following any guidelines, standards or procedures. The standard requirements of the deliverables are often tedious and very time consuming. 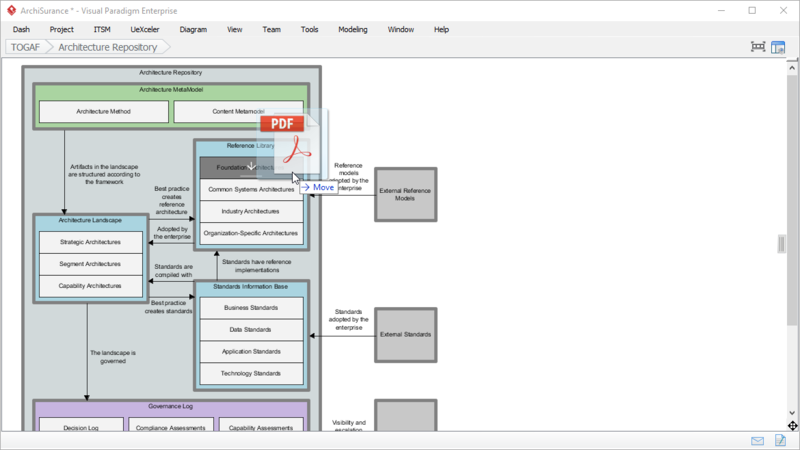 Visual Paradigm's unique Guide-Through Process provides all of the following features: instructions, samples, steps, input references for performing analysis, classify and archive in documentation repository. The Guide-Through Process lets you follow a step-by-step path so you can navigate back and forth within each development phase. 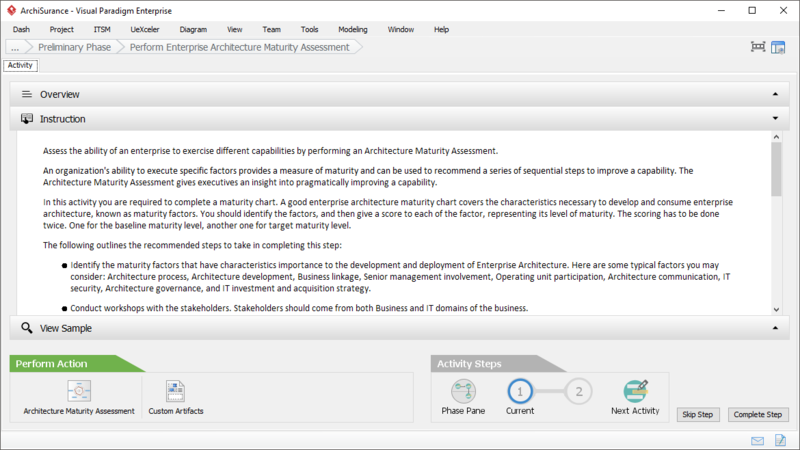 Using the the Process Navigator you can traverse around different phases. The progress indicator pinpoints where you are and what needs to be done in the next steps. Different stakeholders from different domains (project owner, business analyst, enterprise architect and IT professionals) can collaborate easily and effectively. 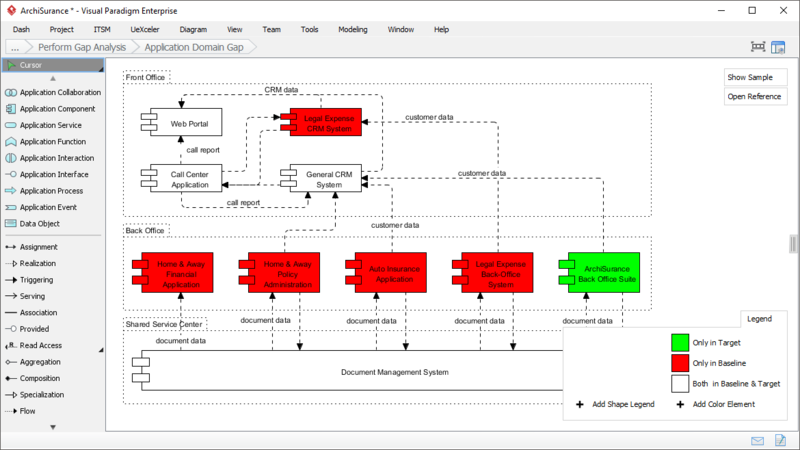 This is attained by following the well designed open standard TOGAF ADM with ArchiMate 3 modeling language support (The Open Group Certified ArchiMate tool). Once you have finished the auto guide-through process as a result number of neatly completed deliverables will be produced. These deliverables contain all the information filled, diagrams drawn and analysis performed which were collected from the guide-through process.